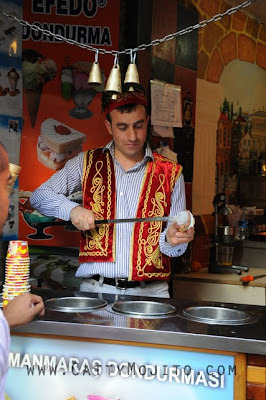 Turkish icecream is delicious - I think I even prefer it to gelato, for I love its stickiness and chewy texture. In Istanbul, dondurma can be found almost in every street, sold by street vendors dressed traditionally (?). The icecream is churned regularly by the vendor even when there's no business - I suppose it is to maintain its stickiness? These street vendors like playing games with you if you're a tourist or have a kid. 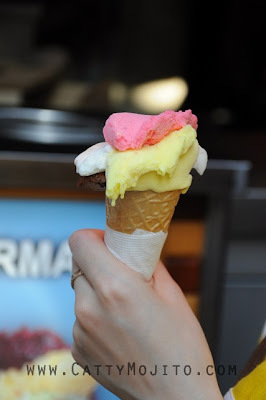 They would ask you to hold the cone, and then quickly withdraw it when you're about to grab it. 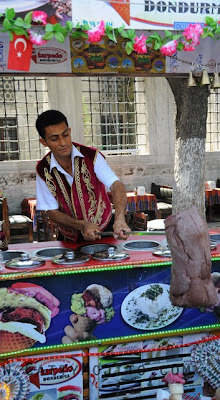 They also ring the bell with your icecream (don't ask me how, or whether it is hygienic or not)! You can get a mix of flavours, like this one. 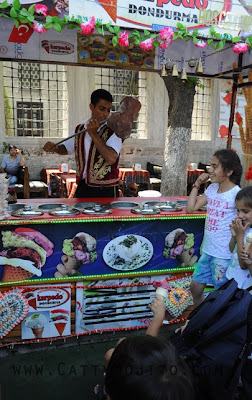 Some vendors have special flavours like pistachio and ginger, but most vendors in touristy places sell common flavours like vanilla, strawberry and chocolate. This vendor is trying to show a kid his huge 'chunk' of icecream. 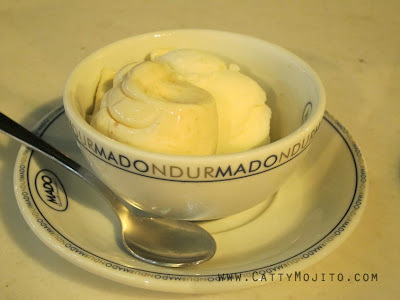 Everybody's heard of Mado - it has branches in many countries. Personally I don't find their icecream especially good, but they have an unbeatable selection of flavours. If I remember correctly, two flavours = 4 lira (around 1.6 quid) - such a bargain!